Impaired driving under the influence of alcohol, marijuana or a combination of the two can lead to serious injury or loss of life. Washington State takes impaired driving very seriously and has proactively created laws to help mitigate it. However, lawmakers in Washington have come to realize that penalizing DUI offenders is not enough. Drug and alcohol education courses help curb first-time and repeat offenders. The end goal is to reduce the amount of fatal accidents and injuries from driving under the influence. Driving under the influence of alcohol is widely understood as an illegal and unwise thing to do. Teens are often educated in school or driver’s education classes on the serious consequences of driving drunk. The CDC reports that 1,921 people were killed by a drunk driver in the state of Washington from 2003 – 2012. In the same survey, 2.1 percent of drivers reported that they tend to drive after drinking too much. The national average is only 1.9 percent. Washington State is one of the more progressive states when it comes to enforcing DUI laws and educating convicted offenders. Recently, citations, arrests and accidents due to driving under the influence of alcohol have been surpassed by another legal drug of choice: marijuana. In 2012, Washington voters legalized Initiative 502 which allowed for adults over the age of 21 to purchase and possess certain amounts of marijuana and marijuana infused products. As one would expect, the legalization of marijuana has increased the number of arrests, citations and convictions from driving under the influence. Drivers who combine marijuana and alcohol are at an increased risk for accidents. The study reported that these drivers were frequently found driving without a license, driving without a seatbelt or speeding. 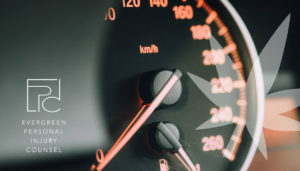 According to the Washington Traffic Safety Commission, marijuana continues to be the most frequently-occurring drug, not including alcohol, among drivers involved in fatal crashes. While marijuana is legal in the state of Washington, driving under the influence of it is not. It can lower reaction times and attentiveness while on the road. It also reduces the motor skills required to safely operate a moving vehicle. Many chronic users often don’t realize that they are driving impaired due to high tolerance levels and the potent products sold in the dispensaries. If you have been involved in an accident where the other driver was impaired from alcohol, marijuana or the combination of both, contact my team and I at Evergreen Personal Injury Counsel. As a Washington personal injury firm, we help clients seek the justice they deserve in the event of an accident or injury.